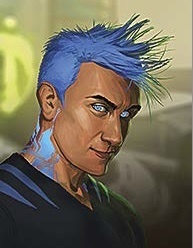 Young human male technomancer, rescued from Deimos prison moon for the Mr Johnson from the Azzie hit, Cristof Mulberry. Apparently had access to useful data in the resonance realms. Fairly snotty and obnoxious, but capable at hacking. Currently in Hong Kong at a secure Wuxing facility. May be kept there by coercion.